Birmingham, Solihull, Bromsgrove, Redditch, Stratford Upon Avon, Warwick, Coventry, Wolverhampton Loft conversion experts. 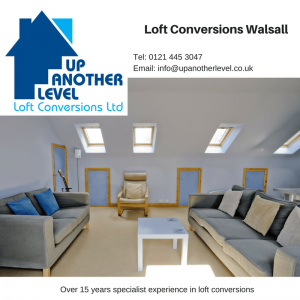 Up Another Level are the experts for loft conversions in Walsall. A family run business, we have over 15 years of experience in adapting unused space into high quality loft conversions, all delivered to customer specifications. Our reputation for providing quality outstanding customer service is second to none as our company continues to grow and expand. For customers looking for a loft conversion in Walsall, Up Another Level are the experts to consult. We work with you from the very beginning of the design process through to successful completion. Regardless of the roof type on your home or property, we can undertake a full review and advise on which type of loft conversion would maximise your current loft space, whilst quoting accordingly. Whether you are looking to gain an extra bedroom, install an office or simply want to expand to use the space as a cleaner storage solution, our specialists can make it a reality. Loft conversions are a popular choice of home alterations, often vastly increasing the value of any property. Our tradespeople maintain their high standards of their craft in every job they work on. We understand this type of work can cause some disruptions to everyday life, but we work to ensure the minimalist of disruption by strategically planning and keeping you informed of our progress every step of the way. As a member of the FMB, you be can assured that all work undertaken by our company is guaranteed. We are also covered by Employers and Public Liability Insurance to offer you protection and complete peace of mind. For loft conversions in Walsall, be sure to make Up Another Level your first choice.